Throw in food processor or blender, serve cold. In a large pot set over medium heat, heat olive oil. Add onions and sauté for 5 minutes. Add broth, carrots, and two tablespoons grated ginger. Bring to boil and reduce the heat, and simmer, partially covered for 20 minutes, until carrots are tender. Remove the pot from the heat and let the soup cool for about an hour. 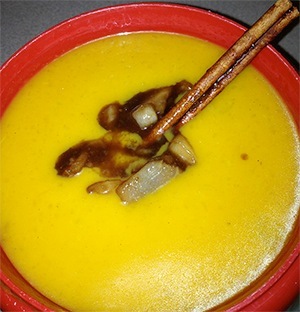 In food processor or blender, blend the soup with the remaining tablespoons of ginger, cinnamon and coriander until very smooth. For thinner consistency, add more broth. Season with cayenne, salt and pepper. Optional garnish with toasted pumpkin seeds. Place all ingredients with 8 cups of filtered water in large soup pot and bring to boil. Reduce heat and simmer uncovered for at least an hour. Let the broth cool slightly, strain and press hard on vegetables to extract liquid. Refrigerate for up to a week, or freeze for two months. 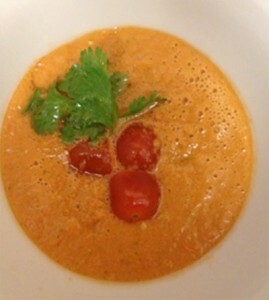 Blend all ingredients of the gazpacho in a high-speed blender, adding in ¼ cup of water that the sundried tomatoes were soaked in. Continue adding more water to achieve desired consistency. Cut 1 avocado into small pieces, the rest of the bell pepper, 3 tomatoes, and 1 tablespoon of minced mint. Place on top and serve cold. Preheat the over to 400F. Halve the squash, cut into 1” chunks, toss with olive oil, salt and pepper to taste and spread out on baking sheet to roast for 30 minutes. Heat the olive oil in a soup pot, over medium heat. Add the onion, celery; stir and cook until the onion softens. Add the squash and broth. Cover the pot and bring to a simmer. Add a bit more water if you need to keep the squash from sticking to the pot. Puree the soup with an immersion blender till smooth. Stir in the maple syrup and coconut milk. Season with sea salt and pepper, to taste. Warm through gently and serve. To make caramelized pears, heat oil in large sauté pan over high heat. Add pears and sauté for five minutes. Decrease heat to medium and stir maple syrup, cinnamon, vinegar, cinnamon sticks, and salt and pepper to taste. Continue to cook for 10-15 minutes until pears are soft and liquid becomes syrupy and coats the pears. Set aside to cool. Serve on top of the soup. If using dried beans, soak overnight. Brush peppers with olive oil, Roast peppers, flat on baking sheet for 15 minutes. When cool enough to handle, peel off skin and remove seeds and chop them. Heat the remaining 2 Tbs of olive oil in asoup pot over medium heat. Add leek, garlic and onion, sauté for five minutes. Add beans and stock(only 4 cups if canned beans. Decrease heat and simmer uncovered for about 1 hour or until beans are tender, and liquid as needed. Stir in roasted peppers, tomatoes, and chipotle powder, salt and pepper, and simmer for 10 minutes. Garnish with cilantro. Directions: Make the pesto- in food processor combine the basil with the garlic and pine nuts, drizzle in olive oil. Add parmesan and pulse until just combined, adding a splash of water if the pesto is too thick. Season with salt and pepoer and set aside. Make soup, in large saucepan, heat olive oil over medium heat. Add onion and cook, stirring occasionally, until softened about 5 minutes. Add zucchini and broth and simmer until zucchini is tender, about 8-10 minutes. Add peas and arugula, return the soup to a boil and simmer until vegetables are tender, about 3 minutes. Let the soup cool for 15 minutes. 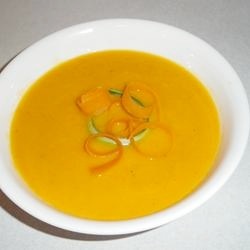 In food processor or blender, blend soup in batches until smooth. Serve with a tablespoon of pesto. In a separate bowl, whisk olive oil, vinegar, lemon juice, lemon zest, cumin and salt together. Toss the lentil with vinaigrette, refrigerate for 20 minutes. Stir in bell pepper, cucumber, olives, mint, and parsley and combine. Add salt, and pepper, lemon juice, and feta cheese on top. Heat the light olive oil in large soup pot. Add the curry paste and cinnamon; stir for a minute to infuse the oil with spice. Add the onion, garlic, sweet potato, and jalapeño. Stir and cook the veggies for 5-7 minutes, until softened. Add the black-eyed peas, white and black beans, broth, melted peanut butter, red pepper flakes and cilantro. Stir in the lime juice and brown sugar or agave. Season with sea salt and ground pepper, to taste. Warm through and taste for seasoning adjustments.